The first mile of the trail follows a wide, exposed logging road through a thicket of white leaf manzanita, knobcone pine, redbud, wild grape and poison oak. Near the creek this brushland transitions into a forest of ponderosa pine, Douglas fir, and canyon live oak. Look for ladybugs in a clearing just before the first creek crossing. Thousands have been seen next to the side of the trail on sunny days in fall, winter and early spring. 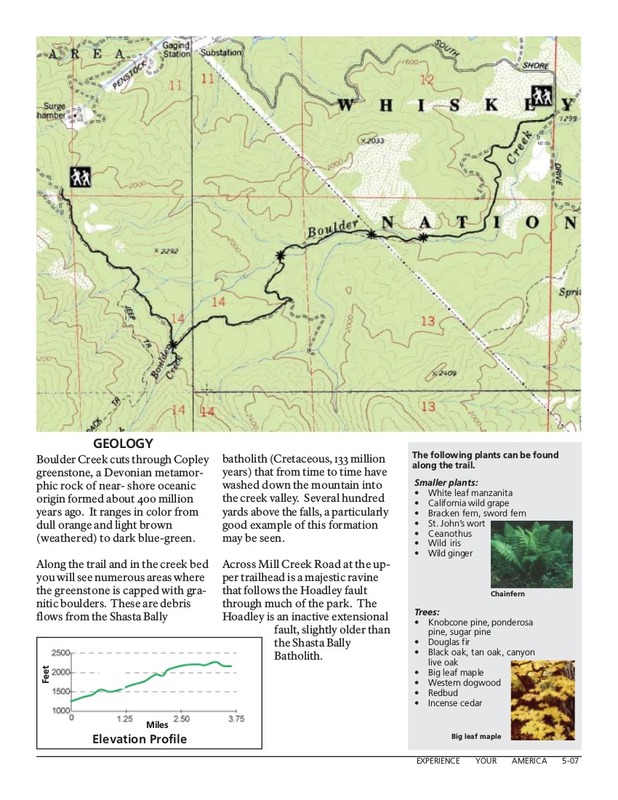 The trail follows the creek for the next half mile, crossing Boulder Creek and a seasonal creek four times. Bracken and sword ferns abound along the creek. Just past the third crossing, on both sides of the trail, are the deteriorating foundations of a residence last occupied in the 1960s. A little farther on, the trail forks; take the right fork. You will come to a nice stand of big leaf maples as you approach the final crossing. Approaching the falls, the trail drops down into a cool watershed. can be seen. The falls directly ahead are 81 feet tall with an additonal 28 feet of cataracts above. Plants that flourish in this riparian habitat are tiger lily, solomon seal and chain fern. Watch for poison oak, and be careful crossing slippery boulders. Boulder Creek cuts through Copley greenstone, a Devonian metamorphic rock of near- shore oceanic origin formed about 400 million years ago. It ranges in color from dull orange and light brown (weathered) to dark blue-green. Along the trail and in the creek bed you will see numerous areas where the greenstone is capped with granitic boulders. These are debris flows from the Shasta Bally batholith (Cretaceous, 133 million years) that from time to time have washed down the mountain into the creek valley. Several hundred yards above the falls, a particularly good example of this formation may be seen. 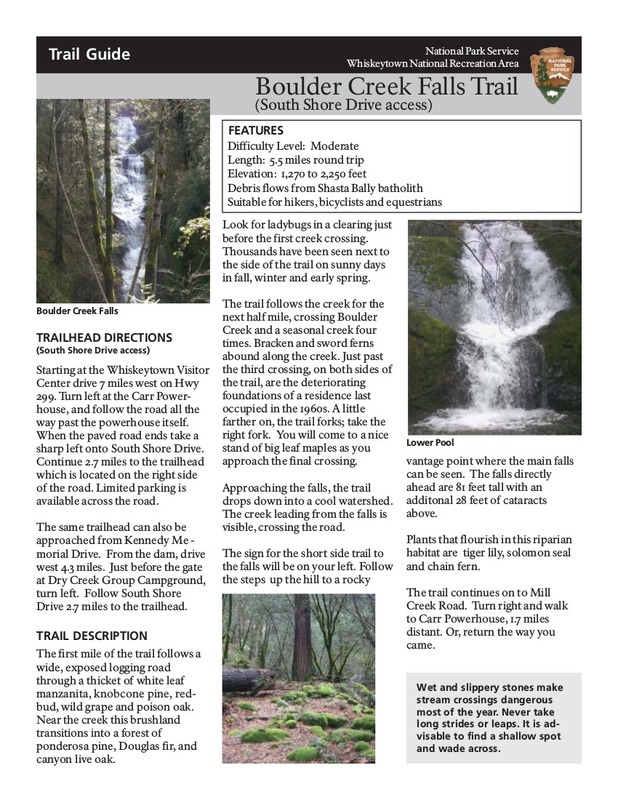 Across Mill Creek Road at the upper trailhead is a majestic ravine that follows the Hoadley fault through much of the park. The Hoadley is an inactive extensional fault, slightly older than the Shasta Bally Batholith. Starting at the Whiskeytown Visitor Center drive 7 miles west on Hwy 299. Turn left at the Carr Powerhouse, and follow the road all the way past the powerhouse itself. When the paved road ends take a sharp left onto South Shore Drive. Continue 2.7 miles to the trailhead which is located on the right side of the road. Limited parking is available across the road. The same trailhead can also be approached from Kennedy Memorial Drive. From the dam, drive west 4.3 miles. Just before the gate at Dry Creek Group Campground, turn left. Follow South Shore Drive 2.7 miles to the trailhead.